My first ballpark road trip of the 2014 season took place earlier this month, bringing me from Albuquerque to El Paso to Midland to San Antonio to Corpus Christi to Austin. Articles from all of these stops have already appeared here on MiLB.com, and I'm in the process of blogging about each visit as well. Even so, I still have more to write about, because there's always more to write about. Today's edition of Farm's Almanac takes you deep into the heart of Texas, with items emanating from Midland and Corpus Christi, respectively. The Texas League franchise now known as the RockHounds, a Double-A Athletics affiliate, played its first season in 1972 as the Midland Cubs. 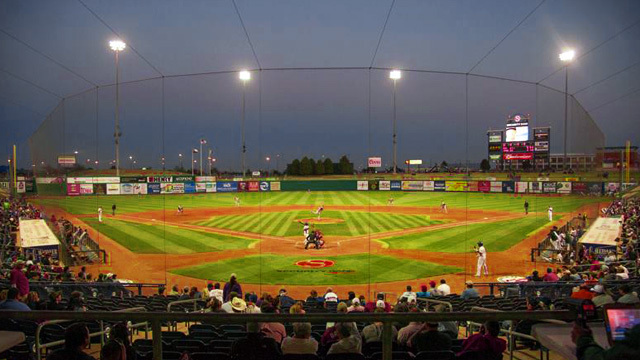 Three decades and two affiliation changes later, the team changed its name to the RockHounds and played its first season at brand-new Security Bank Ballpark in 2002. The RockHounds -- named after a slang word for a geologist -- went on to draw a franchise-record 276,380 fans that season. Setting an attendance record during a ballpark's debut season is a common occurrence, almost to be expected. But what isn't common is what has occurred in Midland over the ensuing 11 seasons. The RockHounds established attendance records in 2008 and 2011 before drawing 317,233 fans to the ballpark in 2013, yet another attendance record. The booming nature of the RockHounds' attendance can largely be attributed to the booming nature of Midland itself. Midland's economy revolves around the oil industry, and in recent years the price of oil has risen dramatically (it is now in excess of $100 a barrel). Business is good. "With most teams, during the honeymoon years there is usually a big spike, then things level off and attendance drops," said RockHounds general manager Monty Hoppel, who has been with the club since 1989. "But our attendance has been higher than in the honeymoon years because more people are moving here. … The economy plays a big part, don't get me wrong, but a lot of us [in the RockHounds front office] have been here for a while. We've worked it hard in a small market because we had to." Midland's population was approximately 95,000 at the time the ballpark was built, and the 2010 census pegged it at 111,147. Since then upwards of 50,000 people have moved to the city, and the influx of people has, of course, meant an influx in cash. Security Bank Ballpark, and the high school stadium that sits adjacent to it, were largely financed via $39 million in bonds backed by a quarter-cent sales tax increase. Hoppel reports that, as a result of the population boom and resulting cash influx, these bonds will be paid off some 14 years ahead of schedule. "We have the lowest unemployment in the nation, and the apartments and hotels are filled up because of the oil people moving in left and right," said Hoppel. "Everyone's happy now that we've got a good investment and are going to pay the stadium off early." That said, the city's growth hasn't been entirely positive for the RockHounds. "Attendance has gone up some, but people are so busy right now and so short-handed," said Hoppel. "Managers and workers are working until nine or 10 at night, and the roughnecks are out in the oil fields. People aren't getting as much entertainment as they'd like because they can't find enough people to work." Tammy Tucker, a life-long resident of Corpus Christi, first attended a Hooks game at Whataburger Field during the team's inaugural season in 2005. "I immediately fell in love with the atmosphere of the ballpark -- it was like love at first game," she said. "To create a rooting interest, I picked a player to watch, and that was Josh Anderson." Anderson, an outfielder who went on to log time with four Major League clubs, spent the entirety of the 2005 and 2006 seasons with the Hooks, the Astros' Double-A affiliate. By the conclusion of his stint with the club, Tucker was, well, hooked. "I got season tickets in 2007 -- I had told my husband that I wanted them -- and now I get 70 days of Christmas every year," she said. And Tucker doesn't just watch the games at Whataburger Field, she documents them. "I had a little point and shoot camera, so I thought that I would try to snap a few pictures because I had always loved photography," she said. "But then it kind of got out of control." Tucker now brings a larger camera, equipped with a Canon 100-400mm telephoto zoom lens, to each and every home game. As opposed to having one player she singles out, à la Josh Anderson, she now makes sure to photograph each and every player who appears with the Hooks. Then, at the end of the season, she gives that player a CD that contains all the photos that she took of him. "[2012-13 Hooks pitcher] Bobby Doran told me, 'If you hadn't taken those pictures, then I wouldn't have any, because I won't let my mom bring her camera to the game," said Tucker. "Most of the players like [the photo CD] -- they'll tell me, 'Oh, this is my mom's favorite picture!" Tucker supports Hooks players in other ways as well. She occasionally takes newly arrived players on shopping expeditions so that they can furnish their apartments, and the day prior to our conversation, she treated three Hooks teammates (David Rollins, Luis Cruz and Mark Wik) to lunch and a game of mini-golf. But ballpark photography is her main focus (so to speak). "I've learned all of the good locations to get interesting shots, you always want to be ready for the home runs and really good plays," said Tucker. "You just never know what you're going to get."